Buyer beware... 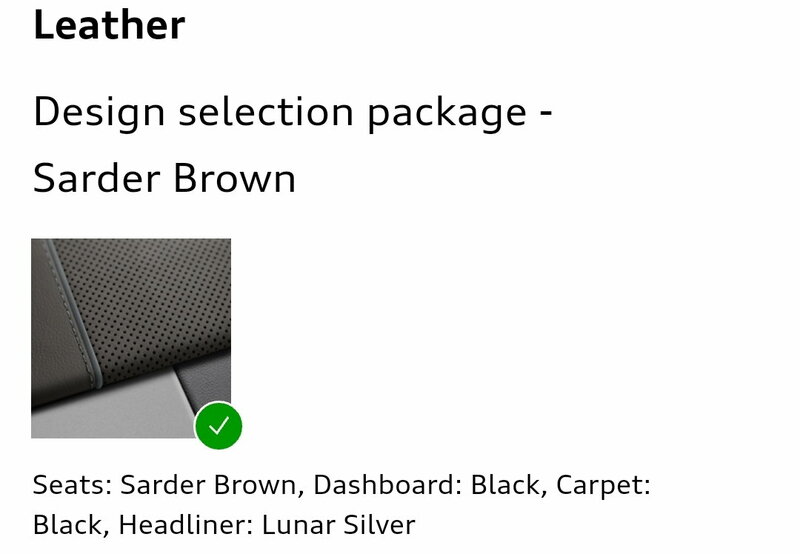 The audi USA website configurator indicates that the sarder brown design package consists of black dash and trim. It does not! It is gray! Gray dash, gray steering wheel, gray door trim, gray everything. The audi order guide conflicts with the website. I have been waiting to see one in person as the pictures of real ones I have seen on Autotrader seem to show this. Really wish it was black rather than gray with all the brown. My dealer is supposed to get one in this week with Sarder so going to see in person and see how I feel about it. On a related note - what is up with the configurator this year? Still has mostly 2018s and several of the 2019 cars have wrong information/pictures or options that are in the order guide not showing up on the site. Wasn't very impressed with Sarder Brown in person. I'm leaning towards the Luxury Package's beige interior over Navarra Blue. I wish they offered us more chocolate/brown options, like BMW's Tartufo. Sorry to say, but its gray. There are several Sarder spec Q8s on cars.com and you can see it. Perhaps in person the gray stitching on the brown seats helps tie it all together a bit. Yes, Audi has done this brown/black/gray combo before, like in my TT with the Audi Design Select Murillo Brown package. It. Is. Stunning. The Grey dash help breaks up the sea of black so many people hate, giving the car a completely different ambient feel, one of exclusivity from the other colors. You'll find 3 colors of grey/black/brown contrast sitting all throughout. You can't really see all of this going on in the low-resolution photos on line. Some will hate it. Some will love it. The entire point is to offer something UNIQUE. It's fantastic in my view. Last edited by f10; 11-17-2018 at 12:24 PM. Yeah, it seems whomever is in charge of the AudiUSA site really has taken an extended vacation. There are lot of issues right now. Build config is still for tons of 2018 models (of which none are truly orderable) and then the 2019 build configs have errors like this Sarder Brown mess for the Q8 and the A7 is missing many options when you try and build. I am sure many other models with issues as well. I really do not get their mindset with all of this heading towards the end of the model year. Most likely due to too many 18's being around, no need for them to encourage 19's so to speak. Besides the Q5, there aren't really any 18s around. At least not in my area.